Functional investigation of rare genetic variants in Parkinson’s disease. Dr. Lam received her BA in Biology from New York University and her PhD in Biology from Louis V. Gerstner, Jr. Graduate School of Biomedical Sciences at Memorial Sloan Kettering Cancer Center, New York. 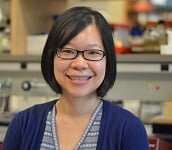 Dr. Lam’s research is focused on studying genetic variants in Parkinson’s disease. The objective of this research is to understand the function of rare genetic variants in Parkinson’s disease. A substantial component of Parkinson’s disease is heritable, but most of this heritability is currently unexplained. Advances in genome sequencing promise to uncover genetic variants that account for this “missing heritability.” However, human genomes contain many genetic variations, and distinguishing variants that are relevant to disease from those that are neutral remains a major challenge. This study implements a high-throughput cross-species experimental platform to enable functional interpretation of rare variants found in patients with Parkinson’s disease. This platform provides information on the effect of the genetic variant on the molecular interactions of the protein it encodes, as well as its genetic interactions in cellular models, thereby allowing us to gain insight into the biological relevance of rare genetic variants. The knowledge gained from this study promises to uncover genetic risk factors for Parkinson’s disease. Additionally, insights gained into the genetic and molecular underpinnings of the disease will ultimately help uncover therapeutic targets and assist in precision medicine diagnosis.